The Isle of Wight Festival kicked off yesterday with sets from Primal Scream and The Stranglers, not to mention weather that lived up to every festival cliché there is. 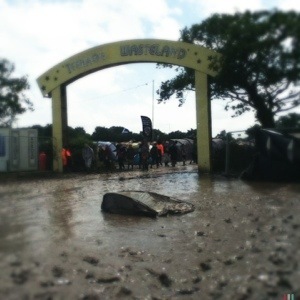 Reports of people queuing in their cars in order to be towed by tractors onto a waterlogged site made Every Record fear the worst as we made our way to the site today. As it happened, the journey was trouble free. Whilst muddy, surveying the site on arrival it was fair to say that the comparisons I read on the festival’s Facebook page with World War One were overdone. But mainly because there was little sign of endless bad poetry. Be in no doubt: there may have been less mud in The Somme. Mud-o-philes will love it here. The people we spoke to who arrived yesterday spoke of ferries stranded in the Solent because the traffic jams wouldn’t allow cars to disembark. One guy I spoke to told of a five and a half hour coach journey to cover the ten miles from ferry terminal to the site. In the end they made sandwiches for the coach driver, cracked open beers for everyone else and made an afternoon of it. As reporters chase the muddiest puddles to report from however, the rest of us put on our wellies, bought a bad hat and got on with enjoying the music. More from Every Record tomorrow when Tom Petty headlines….